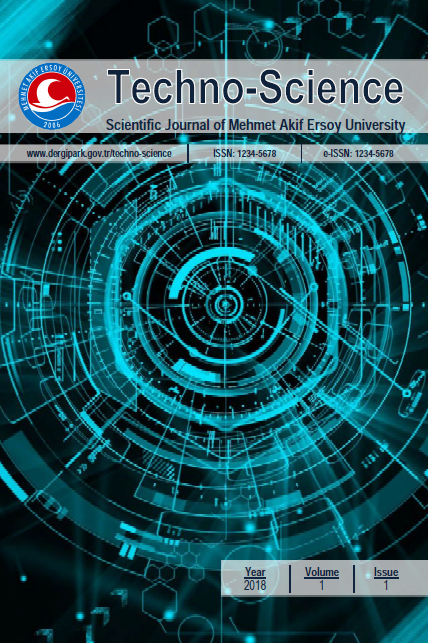 Scientific Journal of Mehmet Akif Ersoy University (Techno-Science) is a peer-reviewed, open access and refereed international journal published by Burdur Mehmet Akif Ersoy University. The first issue of the Techno-Science was published in 2018. Techno-Science accepts only English language manuscripts. Techno-Science publishes high quality original papers in the fields of engineering and sciences. The journal publishes research or review papers in the fields of applied science and technology such as Physics, Biology, Mathematics, Statistics, Chemistry and Chemical Engineering, Environmental Sciences and Engineering, Civil Engineering, Earth and Atmospheric Sciences, Electrical and Electronical Engineering, Computer Science and Informatics, Materials Sciences and Engineering, Mechanical Engineering, Mining Engineering, Industrial Engineering, Aeronautics and Astronautics, Architecture, Health Sciences, Pharmaceutical Sciences, and so on. It allows authors to submit articles online and track their progress via its web interface. The journal aims for a publication speed of 60 days from submission until final publication. Techno-Science aims to publish extensive and reliable information on current developments, innovative technologies and discoveries about science and technology. Papers will be freely accessible online without any subscriptions and restrictions to researchers worldwide.